Ink math assistant in OneNote—When you handwrite an equation, OneNote can not only convert it to text, but also now teach you the steps to solve it. This intelligent assistance makes OneNote your math coach and pairs nicely with Editor, the recently announced intelligent writing assistant in Word. Together, they make Office an even better partner to help you achieve more in your learning journey. Availability: for Office 365 subscribers using OneNote for Windows 10. OneNote helps teach you how to solve handwritten equations. Replay inking in Office apps—To understand what’s behind the ink you see on a page, use new ink rewind and replay capabilities. Follow a sequence of handwritten notes and drawings, review step-by-step instructions, or see the order in which somebody else marked up the document. Availability: for Office 365 subscribers using OneNote for Windows 10. Coming soon to PowerPoint, Word and Excel on Windows desktops. Rewind and replay handwritten notes or drawings. New ink effects in OneNote—Get even more creative with ink effects in OneNote. Inspired by feedback from students, the new rainbow, galaxy, gold and silver ink options help your inking pop off the page and make learning in OneNote even more engaging. 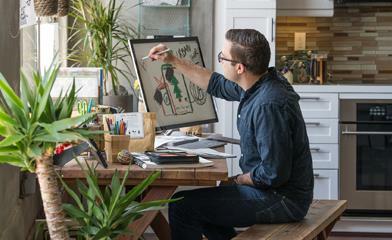 Learn more about the power of Office and OneNote ink. Download the latest version of OneNote to start using the ink math assistant, ink replay and ink effects. Read about other updates to OneNote announced today. Windows Information Protection (WIP) is now supported in Office mobile apps for Windows tablets and phones. Previously announced with the Windows 10 Anniversary Update, WIP is an enterprise-ready solution that helps prevent accidental data leaks while letting users maintain control over their personal data. Simply designate content you create in these apps as “work” or “personal” so that your IT department can protect or remove only business data. Download the latest versions of Word, Excel, PowerPoint and OneNote to start using WIP. Availability: for Office mobile apps. Coming soon for Windows desktops. Windows Information Protection lets you designate documents as “work” or “personal” so IT restricts only business data. Commercial customers can now go beyond a person’s basic contact details with deeper, more intelligent people experiences in Outlook on the web. Clicking a coworker’s name helps you discover more information about them, including their organizational chart, who they commonly work with (powered by the Microsoft Graph), Office 365 Groups they’ve joined, as well as recent emails, files and meetings you have in common. Learn more about these and other new people experiences. Availability: in Outlook on the web for commercial customers. Coming soon to more Office 365 web experiences, such as SharePoint Online and OneDrive for Business. New people experiences in Outlook on the web help you discover more about your coworkers. Availability: Visio Online Preview is rolling out for commercial customers in First Release. Office 365 admins will get a Message Center post when the Visio Online Preview is available for their organization. Visio for iPad is available via a limited Office Insider Program. 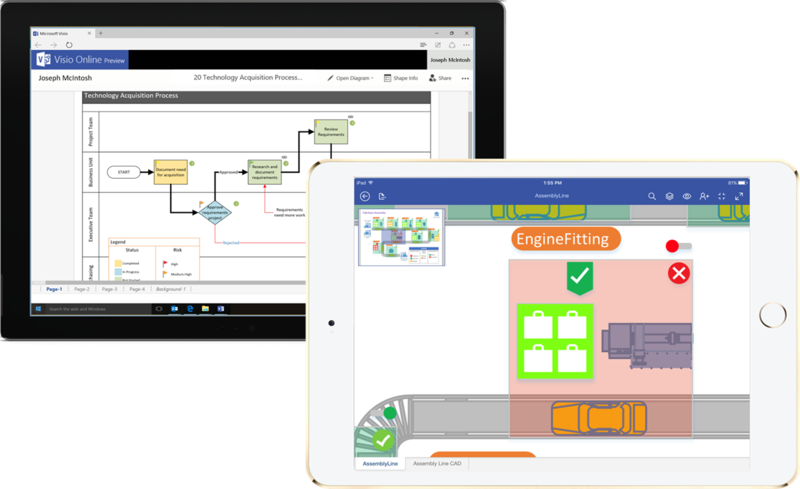 Visio Online and Visio on iPad let you view, interact and share your diagrams on more platforms. Accessibility updates—We have been hard at work making rapid progress on our accessibility roadmap outlined earlier this year. Recent updates to apps like Word, Outlook and SharePoint Online bring us closer to achieving our goal of ensuring that people with disabilities can communicate, consume and create content on any device. It’s also easier for everyone to create accessible content, with Accessibility Checker now available to any customer using Office 2016 for Mac. 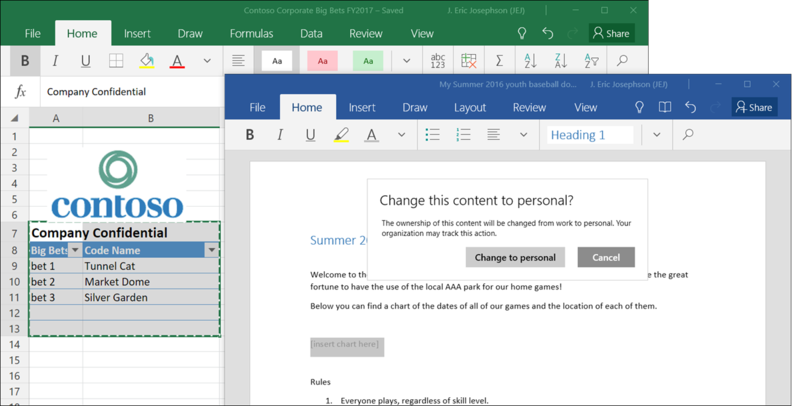 Follow this blog series for news on upcoming accessibility enhancements. In-app assistance—In Office apps on Windows desktops, now it’s easier to find help documentation when you type a search into Tell me. Also, Office 365 Home and Personal subscribers in the U.S. can chat in real-time with a Microsoft support agent without leaving the Office app you’re using (we’ll expand to more markets soon). Chat in real-time with a support agent in Office apps. 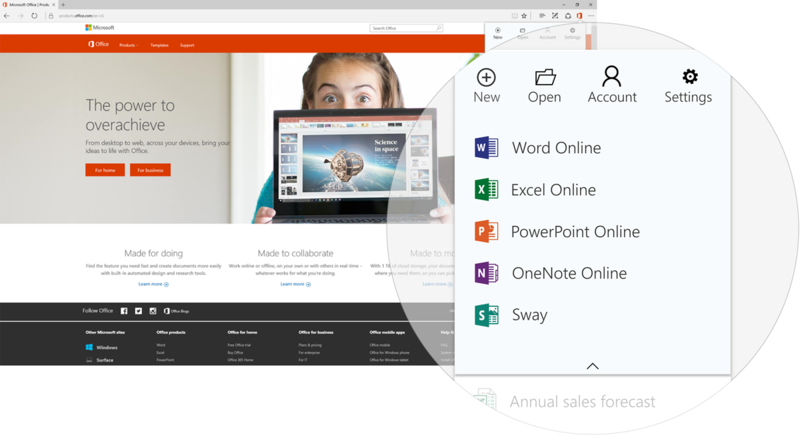 Office Online extension for Microsoft Edge browser—We’ve had over three million installations so far of the Office Online extension for Chrome browser. Now, the same award-winning Office Online extension is available for Microsoft Edge. Right from the top of Edge, you can easily create new Office documents, access your recent files, and open content stored on your OneDrive, OneDrive for Business or your computer. Download the extension to get started (Windows 10 Anniversary Update required). Use the new Office Online extension in Microsoft Edge to easily open Office documents and edit them in the browser. 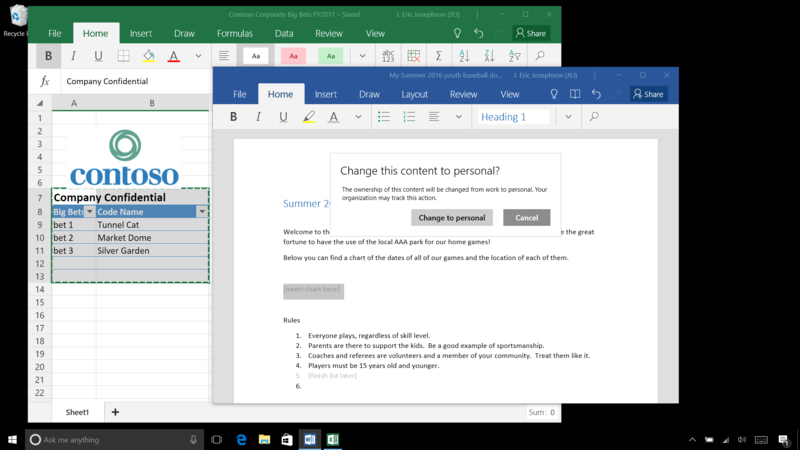 Since the launch of Office Insider last November, more than one million Insiders have used pre-release builds of Office across platforms and provided more than 100,000 pieces of feedback. This partnership has helped us ensure a high-quality Office experience for all our Office 365 subscribers worldwide. Thanks to our Office Insiders for all their feedback and support! Coming in the next few days, we’re adding a new level called Office Insider Fast for Windows desktops, Mac and Windows Mobile (Android and iOS coming soon). The Fast level provides even earlier builds of Office, more frequently. In fact, these builds are what Microsoft employees have access to internally. Office Insider Fast is best for Insiders who want to use the earliest preview builds to identify issues, provide feedback to help make Office great, and who don’t mind a bit of risk using unsupported builds. Availability: coming in the next few days for Office 365 Home and Personal subscribers (learn more at Office.com/insider). Follow @OfficeInsider for updates and support. 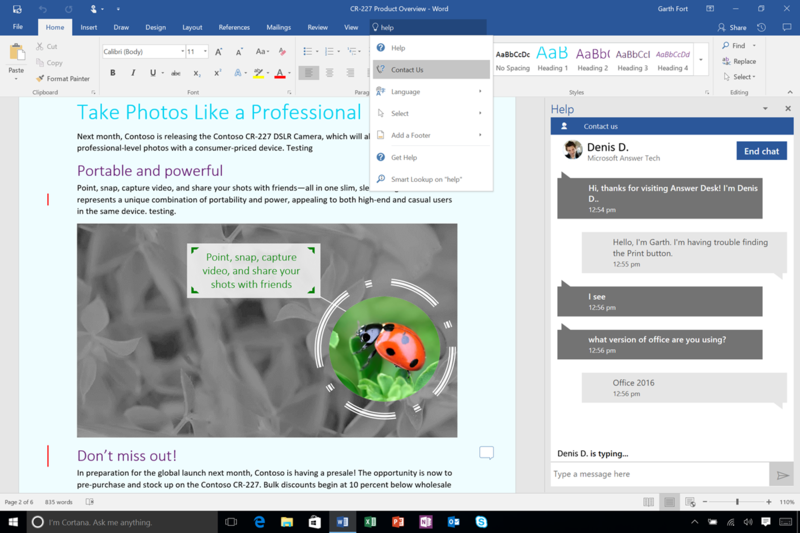 Commercial customers can use early builds of Office through First Release.